Review by AllTheBestFights.com: 2016-05-28, pretty good fight between Ricky Burns and Michele Di Rocco: it gets three stars. The former world champion in two different weight classes Ricky Burns entered this fight with a pro boxing record of 39-5-1 (13 knockouts) and he is ranked as the No.18 super lightweight in the world. He fought three times last year losing to Omar Figueroa Jr (=Figueroa vs Burns) and winning over Prince Ofotsu (=Burns vs Ofotsu) and Josh King (=Burns vs King). 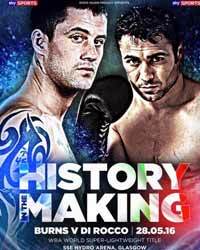 His opponent, Michele Di Rocco, has a record of 40-1-1 (18 knockouts) and he entered as the No.29 in the same weight class. He suffered his only defeat when he faced Giuseppe Lauri in 2007, since then he has collected 23 consecutive victories taking revenge on Lauri in 2012 and beating Alexandre Lepelley in his last bout. Burns vs Di Rocco is valid for the vacant WBA World super lightweight title. Watch the video and rate this fight!